The DKN R200 Magnetic resistance allows you to build your cardiovascular fitness with the traditional rowing motion, and increase your workout with muscle-specific training resistance. Rowing works over 80% of the muscle groups in the body making it one of the best workouts you can do for cardiovascular training and all over workouts. A magnetic manually adjusted resistance control applied to 8 kg flywheel results in a quiet, smooth magnetic resistance in every stroke at every intensity level. The R200 offers you a motivational multi-functional LCD screen that allows you to get feedback on stroke count, time elapsed, total count, calorie burn, pace per minute, pulse. There is even the option for a wireless heart rate monitor to accurately read your pulse. A high grade 125cm aluminium rail allows the seat to move smoothly and facilitates full leg strength in the rowing stroke and provides a true, full-body workout. 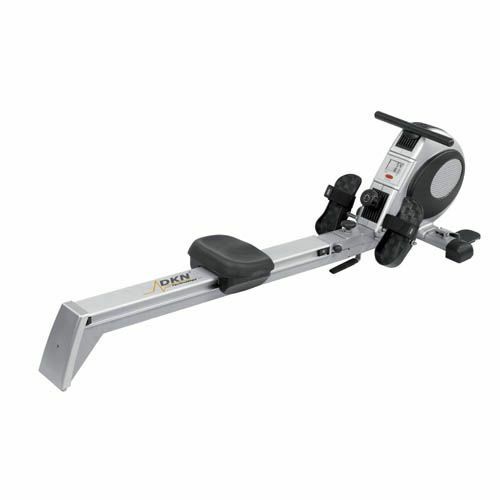 The pivoting footplates ensure a natural action and stroke every time, and added to this is a new design frame lock mechanism that makes it easy to fold the rower up when out of use for simple transport and storage. 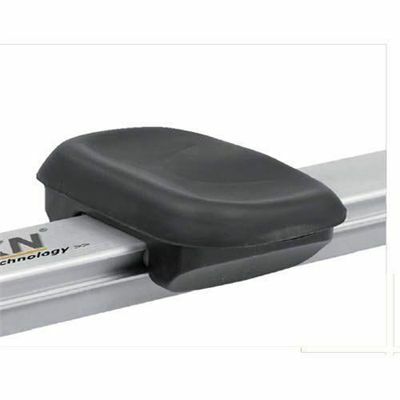 for submitting product review about DKN R200 Folding Rowing Machine.